Reserve Mountain View 2704 Today! We had a wonderful stay! Condo was clean and had everything we needed to make our stay great! My family enjoyed our stay and the condo was truly comforting and I highly recommend you guys!! We have stayed here a couple of times and I highly recommend the property. Great location... Very clean and we feel safe. We will be staying here again! We stayed at the Mountain View condos. The place was very clean and comfortable. I will recommend anyone the place was everything. Only thing is that the TVs could be a lil bigger. Other then that the place was great. It was a great condo. There’s some things that could have been much better. The couch was uncomfortable. The balcony doors were hard to open and close. The tv’s, the one in master bedroom only played one channel, that was the tourist channel, the tv in other bedroom only played the disney channel. We tried several different things to get them to show more channels. The master bedroom bed could have been better. We also could have had more towels. Everything else was great though. Kitchen was not well stocked for meal prep. It was OK to fix breakfast, but otherwise it was a challenge. Several lamps and dining room light needed light bulbs. Towels were thread bare. Overall needed some TLC maintenance. It was quiet which we liked. Awesome view. Everything was wonderful. All rooms were clean and the beds comfortable. Plenty of space for all of us. A home away from home. The staff was pleasant and helpful. We recommend Cabins USA. We will try a cabin on our next visit. Thanks. This condo was awesome. Plenty of space and full kitchen if you need it. The location was close to several amenities in the area. We had a nice view from the balcony!!!! I give it a 10!!! If i had one complaint it would be the mattress, but its well worth the money. Check in was at 4 o'clock and when we arrived the condo had not been cleaned. We had to go out on baloney until it was cleaned with a thunderstorm brewing. The cleaning staff did a hurry up job which means it was not throughly cleaned. Also there where no baking sheets in the kitchen and the light over the stove didn't work. This was not our first choice of rental. Due to certain circumstances, we opted to stay here versus where we were originally supposed to stay. It was a nice condo. Very close to lots of attractions. However, I wish it would have been at a traffic light for easier access to making left-hand turns. However, there was a turn-around just up the highway. It was very clean. Cabins USA staff, particularly Yulia, were VERY accommodating to our needs. I would DEFINITELY rent with Cabins USA again. If the wall at the trash can right outside the kitchen wasn't so nasty and there were a few "extras" like coffee filters and some aluminum foil, I would habe given it a nine all the way. I would have given a ten if the condo didn't crack and pop all night. This condo exceeded our expectations. It was very spacious, clean and affordable. 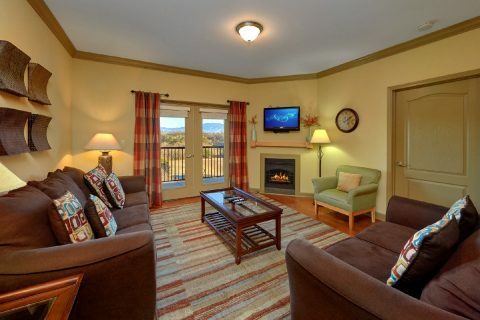 We will definitely be booking this condo when we return to Gatlingburg.